Coroplast Signs - Inexpensive and Cost Effective! 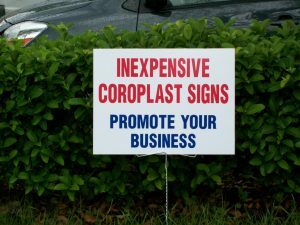 Coroplast is the universal material for all kinds of inexpensive signs. They are used for special events such as county/city events, political events and campaigns, real estate signs, bandit signs, snipe signs, yard signs, inserts for sandwich board signs, temporary signs, and so on. The most common size used is 18" x 24" and can be ordered with extra attachment possibilities such as wire stands or grommets. They can be silk screened, topped with vinyl lettering, or full color digitally printed.